BelarusDigest > All > EU Aid to Belarus: Financing the Dictatorship or Keeping Illegal Migrants Out? On 19 October, British newspaper The Daily Telegraph published an article, where it criticised the UK for its contribution to the EuropeAid programme on EU-Belarus border cooperation as helping the Belarusian dictatorship. The technologies provided by the EU, the author argues, can be used to prevent the Belarusian opposition from escaping from the country. In reality, border security has little to do with the Belarusian opposition. Border cooperation remains one of the few areas where Belarus successfully cooperates with the EU and receives financial aid. The interest here is mainly European, as the issue of illegal migration, terrorism and trafficking is critical for the EU. The undemocratic Belarusian regime, despite all its problems with the EU, prevents a mass inflow of migrants and contributes to European security. The UK Government Finances the Dictatorship? On 19 October, British conservatively oriented newspaper The Daily Telegraph published an article titled “EU passes British aid to Belarus dictator”. The article discussed the fact that European Union’s EuropeAid programme, to which Britain’s Department for International Development is a major donor, provided £68 m since 2007 to autocratic Belarus. This money, directed mostly at border security issues like people trafficking, drug smuggling and illegal migration, arguably will help to strengthen the control of the regime over the movement of opposition. The author based his statement on the words of a Belarusian dissident, who resides in the UK according to whom “With such equipment they would block all possibilities of escape completely. It would be a completely isolated country”. The author also cited Jim Murphy, the Labour shadow development secretary, who said “Aid is vital to help alleviate poverty and to support UK national security and economic interests. It should not support regimes in countries of concern with alarming human rights records”. In the online comments below the article, the outraged public condemned the UK and the EU government for helping the dictator while many Brits are in need. The comments urged to vote for the UK Independence Party (UKIP) in the future to prevent such a shameless waste of money by “faceless EU bureaucrats”. On 21 October, the European Commission categorically denied the story in The Daily Telegraph. The European Commission spokesperson said that Brussels had financed equipment for border guards in order to prevent the illegal trafficking and the smuggling of goods on the border between the EU and Belarus. All projects that receive funding have been discussed and approved by all EU member states. The EU representative also underscored the fact that its money is earmarked for so-called "neutral sectors" where it cannot be used to enhance the regime in Minsk. Indeed, according to EU documents, it cooperates with Belarus on security issues which, first and foremost, concern EU interests. EU aid hardly affects the regime's sustainability. Border management and customs services has been the largest recipient of the EU aid and received €74m since 2001. The assistance included the demarcation of borders, equipment for guards and customs officials, financing the reconstruction of border crossing points, the training of the staff and policy advice. Another functioning field of cooperation has been combating human and drug trafficking. Here, the EU allocated much less, around €9.1m since 2001. Apart from these two fields, cooperation with Belarus in the sphere of security did not take place since the 1990s. And considering even the funds mentioned above, they seem quite small in comparison to other EU aid programmes. For instance, in 2012 the EU committed €52m to justice sector reform in Moldova, a small post-communist country with population of 3.5 million. As the Belarusian border committee reports, Belarus annually spends around $125 m for border management, while the EU allocates only $7m annually for this purpose. The argument cited by the Telegraph article, which considers EU aid to Belarus border management a threat to the opposition, seems irrelevant. The regime can easily control all opposition personalities and their movement inside the country. Escaping via the Belarus-EU border presents the most unwise way to go because Belarus has no real border with Russia and fleeing there provides many more opportunities. 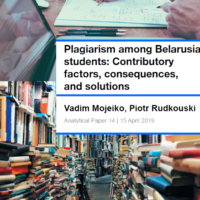 Moreover, it appears that Belarusian authorities actually encourage activists to leave Belarus who are usually less harmful for the regime outside rather than inside Belarus. For Belarusian authorities, cooperation in the border area has been of major interest as it provided at least some international legitimation and did not demand vast reforms inside the state. In his speeches, Lukashenka always presents Belarus as a secure wall on the way of illegal migration and trafficking to the EU. In periods of tension, however, Lukashenka tries to use the issue of illegal migration in order to blackmail the European Union. “We stop tens of thousands of migrants who are trying to move to Europe annually, but the EU continues to criticise us. Now we will let them all out. We have no funds to continue doing this, and if the EU will not pay us for dealing with the issue, we are not going to protect the borders,” he said in 2012. However, such developments will hardly take place, as the regime also realises the degree of this threat to the EU. The threat of illegal migration through the territory of Belarus is real. In August 2013, German newspaper Frankfurter Allgemeine published information provided by German police, which said that every week as many as one Chechen village slips through the Belarusian-Polish border. In the first half of 2013, 9,957 Russian citizens applied for asylum in Germany and most of them descend from the Chechen Republic. Belarusian police give some more statistics – last year 20 thousand people attempted to cross the border and ask for asylum and 11 thousand of them were sent back to Belarus, which in turn sends them to Russia. But since there exists no border between Russia and Belarus, those who failed to reach the EU come back and make another attempt. They live in the border areas of Belarus for months trying to get into the EU. These figures do not include migrants who try to slip to the EU by bypassing the crossing points. Detention of such groups is part of the daily routine for Belarusian border guards, and no one knows how many migrants succeed annually. Among them are not only people fleeing from regions of conflict or seeking economic welfare in Europe. Any one of them could be a potential terrorist whom the authorities would hardly be able to identify. Not to mention the channels of drug trafficking from Asia to Europe or the smuggling of cigarettes and other illegal activities. So, it looks like the EU's aid to Belarus is not a waste of money by faceless bureaucrats, but a strategic policy that covers important issues in European security. The UK officials made statements on aid to Belarus out of political reasons without any analysis of the situation at the EU's eastern border. UK citizens should not therefore be misled: in this area the Lukashenka regime, although undemocratic and repressive, indeed contributes to their security. Faced with major threats to its macroeconomic stability and the unfortunate timing of the potash conflict, the Belarusian government came up with a plan of structural reforms. The plan should reinvigorate the economy and improve expectations for the country's economic agents. The current facts, however, give little reason for optimism in the short run. GDP is stagnating, currency reserves are melting away, the ruble is devaluating, and there is no money to pay off debts. The government has to cut back on social support, and it is important that it creates a new, efficient safety net for those in need. The recently released plan for structural reforms of the Belarusian economy contains many ambitious goals and reforms, some of them more detailed and others only simple declarations of intent. The main directions of the plan are the contraction of direct lending programmes, budget reform, tax reform, privatisation, a shift in its direct social supports and the further liberalisation of the economy. In other words, the plan addresses most of the structural problems Belarus has accumulated over the years. Moreover, the solutions offered look surprisingly in line with the usual recommendations of international organisations like the World Bank or IMF. The plan also contains a lot of unpopular but necessary measures like cuts in utilities subsidies and in other socially oriented subsidies. The government should carry out some of the points of the plan till the end of 2013. The major reforms are scheduled for 2014. Some experts have already expressed doubts about the government’s commitment to the plan. Indeed, the 2011 loan from EURASEC Anti-Crisis Fund came with similar conditions (the contraction of direct lending programmes, privatisation, liberalisation of the economy etc. ), and Belarus did not meet them. Now the government is signaling its commitment more persuasively. For example, on 22 October 2013 the Ministry of Economy revised its estimate of GDP growth for 2014 down from 5.7 to 2.4 per cent. On the other hand, this estimate is still more optimistic than the 1.5 per cent estimate of the World Bank. The creeping depreciation of the Belarusian ruble continued in October. Despite the continued efforts of the National Bank to regulate the demand for currency by restricting ruble liquidity on the inter-bank market, devaluation pressure itself has not disappeared. There are three main forces that affect the exchange rate negatively: the need to repay IMF loans, a negative trade balance and the unfortunate timing of the potash conflict. These forces will continue to put pressure on the exchange rate in the coming months. Meanwhile, the international reserves at the National Bank of Belarus have declined significantly: on 1 October 2013 only $7,387.7m remained in the reserves when calculated using the IMF's methodology (compare it to the $7,701.4m on 1 September 2013). We expect reserves to contract once again in October due to several payments to the IMF. The current situation on the currency market demands external sources of financing. Luckily, Sberbank agreed to refinance the $1bn loan issued to Belaruskali at the end of 2011. Out of this loan $800m went directly into the international reserves of the National Bank. Belaruskali had to repay the loan this year, and the new refinancing deal with Sberbank relieved part of the pressure on the country's reserves. But it is not enough. Many experts believe that the government and the National bank designed the Plan of structural reforms mainly to persuade international lending organisations (IMF and EURASEC Anti-Crisis Fund in particular) to open new credit lines for Belarus. The 2013 is a year of frugality for Belarus, and not only because it is the country’s motto of the year. The budget revenues this year are lower than expected. The income tax revenues are especially low: in January-August 2013 the tax administration collected only 52.7 per cent of what it had in its annual plan. The low tax revenues are not surprising: the majority of the large taxpayers are not making any profits due to the burdens of high wages being paid out and low external demand. The government realises that the budget deficit is not temporary. Budget cuts are now being carried out everywhere. In particular, the number of government employees is decreasing, and the government has cut back on many price subsidies. The tax administration is on the lookout for new sources of revenue. The plan for structural reforms includes the possibility of introducing a unified property tax that will be an effective redistribution tool. The talks about the $100 exit fee are now in the past, but the government is still considering a tax on unemployed. Of course, this tax is not targeting the unemployed in the usual meaning of the word; the intent is to tax those who work abroad but come to live and receive education, health care and pensions in Belarus. Technically this tax is very difficult to implement, and this is arguably the only reason why it has not yet been introduced. To sweeten the pill of budget cuts and lower social support, Lukashenka announced a big new social program for fertility support – the Big Family project. The main idea of the project is to give $10,000 for the first child, $20,000 for the second and so on. Projects like this are very popular, and may help some families overcome financial difficulties. However, very little evidence suggests that monetary stimulus can boost fertility on a macroeconomic level. Evidence of the effects from similar programmes in Russia and Ukraine also remains inconclusive. The plan for structural reforms stipulates in general designs a transition to direct forms of social support: a shift from subsidising prices for everybody to direct income transfers for those in need. It is hoped that plan is followed through, as this reform is necessary, especially given the current level of unemployment benefits – which today stands at less than $15 per month in Minsk.